Riteway Curtains and Blinds offer the most comprehensive range of blinds, awnings, shutters and curtains, ensuring there is a solution for your requirements. In addition to exclusive products only available through LUXAFLEX®, we also offer solutions for shaped windows, skylights, hard to reach windows, and can also provide motorised solutions. Riteway is a family owned Company, operating since 1972. 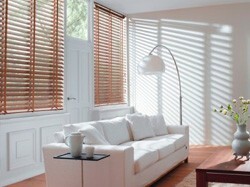 Our expert team have over 30 years of experience supplying the Canberra region with quality blinds and curtains. We can visit your home to provide an obligation free in-home consultation to ensure we assist you in selecting the best solution to suit your individual style and functional requirements. You will receive experienced, personalised and expert advice from our friendly showroom staff. Our service doesn’t stop in the showroom. When it comes to installation, all Riteway’s installers are Luxaflex® trained professionals – ensuring you get the best result. Come and experience our stunning showrooms. Riteway has the only official Luxaflex® Window Fashions Galleries in the Canberra region. Our showrooms take the display of window furnishings into an entirely different and exciting dimension. Our state of the art Galleries feature the LUXAFLEX® Window Fashions range. We invite you to visit and operate the products on display which include motorised window covering solutions for the ultimate in home automation. You can also look through the entire colour range with a comprehensive sample collection.